Please join us at the next Friends of Atlantic City Nursery (FACN) meeting for project updates and committee work sessions, Sunday March 7th Rainier Beach Public Library at 1:00 pm. The goal of the project is to repurpose the greenhouses and growing space at Atlantic City Nursery for urban agriculture and create a local distribution system so that the food produced provides fresh, nutritious food for residents of the Rainier Valley community. Here’s a little addition information on the project: Atlantic City Nursery Flyer. Also please join us at the 1st FACN Community Outreach event on the evening of March 18th at the Atlantic Street Center inside of the Rainier Beach Community Center – details to follow. October 1, 2011 Rainier Beach Urban Farm Breaking Ground Event draws over a hundred people! PreviousAtlantic Street Center: Building Bridges to the Future! 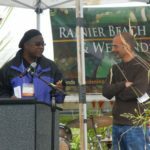 “Guide to Rainier Beach, vol 1” to be released at RB Town Hall Mtg tonight! Today’s Atlantic City Nursery Public Meeting Moved to the Nursery Site!